While the preparations were taking place, Diepenbrock strongly objected to the new Dutch translation the poet and classicist P.C. Boutens (1870-1943) had made at Royaards’ request. Therefore the composer initially refused to take part and even advised Royaards in a letter of 20 November 1919 to perform the tragedy without music. According to Diepenbrock, who was a classicist himself, the language Boutens used in his translation tended to obscuring the meaning of the original tex: “It is far too anti-Hellenistic and totally unbefitting of Sophocles.” (BD X:157) Nevertheless, he already made the first sketches for his incidental music at the beginning of December and after that he made fast progression. The overall composition process of the Muziek bij Sophocles’ Electra can be reconstructed by means of the dates in four surviving sketchbooks. Diepenbrock composed the majority of the work in his summer house in the village of Laren over a period in ten days in January 1920. The speed at which he was working, indicates that he was only too eager to set the text to music. Not only had Diepenbrock already had a great liking for Sophocles since an early age, there was another reason as well. Ever since attending the Dutch premiere of the opera Elektra by Richard Strauss in The Hague on 12 February 1910, Diepenbrock he had been ambivalent about the work. This was mainly due to the text that was used, the libretto by Hugo van Hofmannsthal. Royaards’ commission offered Diepenbrock the opportunity to reveal “the true Sophocles” (BD X:279) through his incidental music. 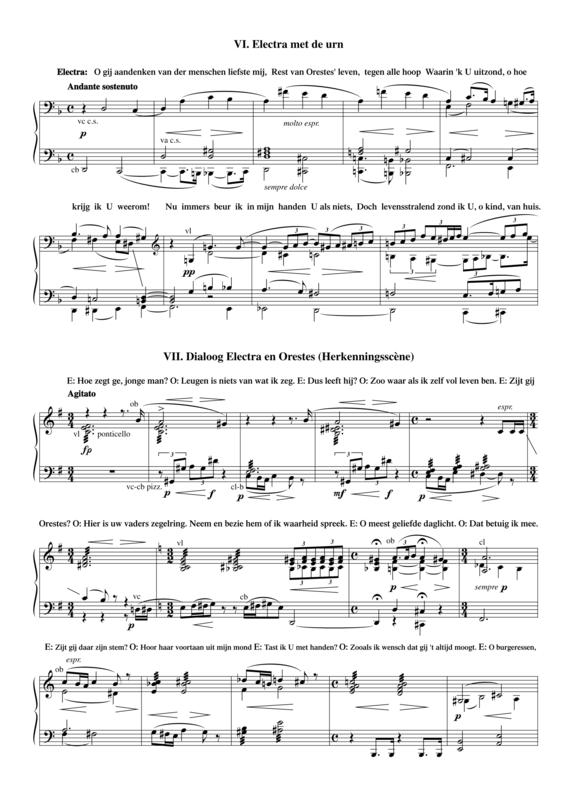 Diepenbrock’s Muziek bij Sophocles’ Electra consists of nine parts. All the sections of text are set as melodrama, including the choral songs, which according to the ancient Greek tradition were performed with music and dance. Besides these choruses (the antiphonal song of part II, all of part III, IV and V, the antiphonal song of VIII, and the complete epilogue IX), the beginning of the Proloog (Prologue, I), Electra’s Threnos (Electra’s Threnody, II), the Scène met de urn (Scene with the Urn, VI) and the Herkenningsscène (Recognition Scene, VII) have been set to music too. 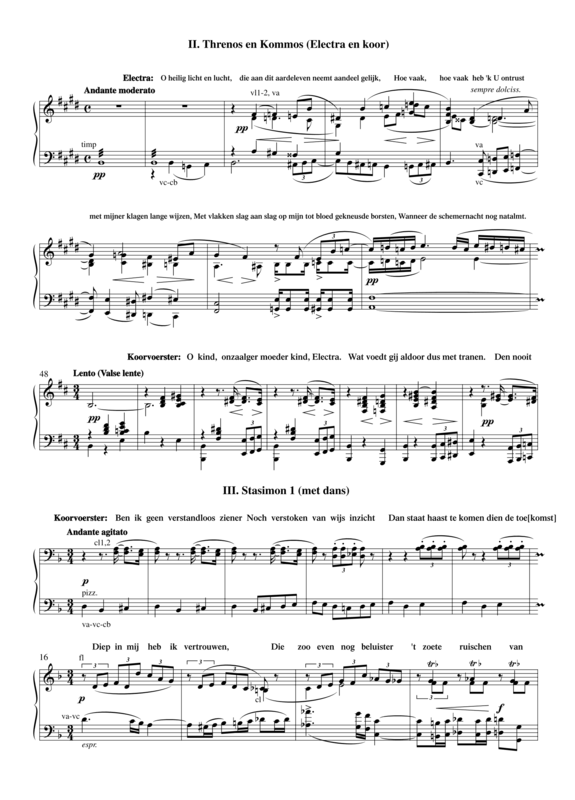 Diepenbrock gave the indication ‘with dance’ for each of the choral songs, as this was an essential aspect of the Greek tragedy that was not to be left out. 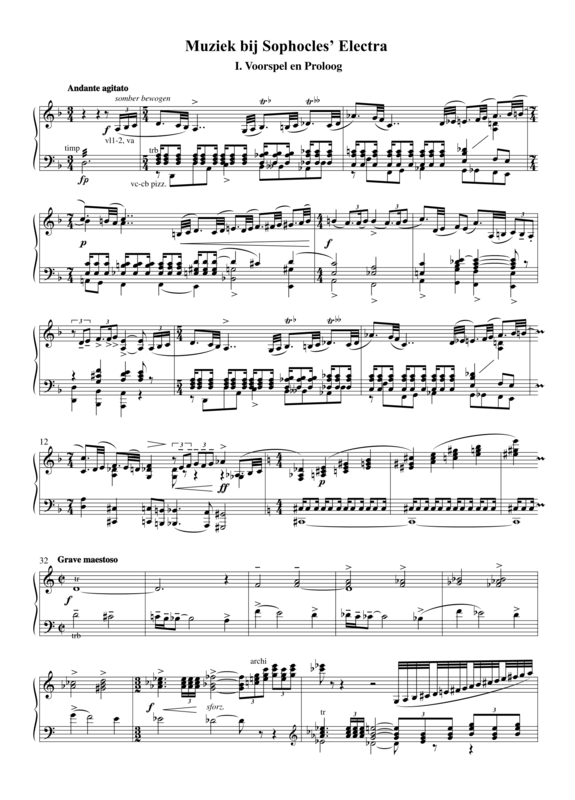 The orchestral prelude – an ominous introduction to the drama that is to follow – consists of three parts (Andante agitato – Grave maestoso – Grave, sostenuto, agitato) in which the main themes that are to appear in the course of this incidental music, are presented. Some of them are linked to the characters of Electra and Orestes; others, such as the ‘Oracle of Apollo’ (chords ascending via a series of minor thirds that depict justice) and the ‘Fate theme of the Atreides’ (descending chromaticism in a snappy rhythm – see m. 32), symbolise the higher powers that dominate the tragic events. The composer made Elisabeth Diepenbrock write down these designations in February 1921 (see BD X:327-328). The specific timbre of the Muziek bij Sophocles’ Electra is greatly due to the well conceived combination of wind instruments, in which the trumpets and trombones (rendering the rhythmically striking ‘Fate theme of the Atreides’) play a major part, and the horns and bassoons are absent. According to the composer, their timbre had no place in the work. 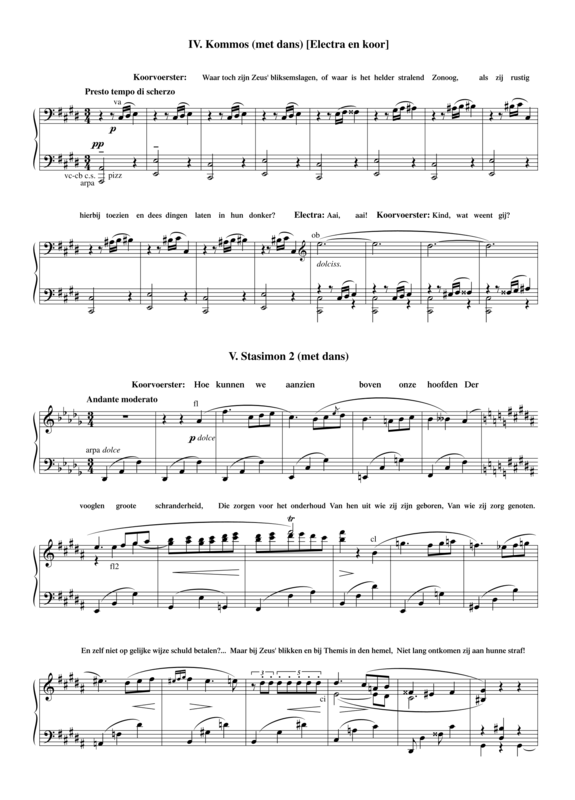 (BD X:327) Like before in Lydische nacht (Lydian Night, RC 118), Diepenbrock regularly accompanies the spoken voice with a combination of oboe d’amore and English horn, often in a majestic (maestoso) movement. This duo appears everywhere where the text refers to Electra lamenting the murder of her father. Originally Diepenbrock had intended the orchestration of his Muziek bij Sophocles’ Electra, with seven woodwinds, six brass instruments, harp, strings and percussion, for “a group of around 40 members” of the Residentie Orchestra. (BD X:285) However, due to limited financial resources, Royaards had to contract the new City Theatre Orchestra of Richard Heuckeroth (1885-1960) for the first series of performances. As this still inexperienced orchestra consisted of only 25 musicians and Diepenbrock was not able to conduct himself anymore either, he was rightly concerned about the quality of the performance. But as soon as the music claims a place of its own alongside or above the author, as soon as the music demands the attention of the audience at the expense of the spoken text […], it is wrong, as it restricts, in other words goes against the spirit of the play. The dignified tempo (partly necessitated by the musical accompaniment) prompted van Gasteren to declaim the message of The Tutor in a very slow tempo, but how excellent he was and how beautiful is his voice, also for the morality of the tragedy! But as before in 1918 when Faust (RC 141) was performed, realising scenic movement, which meant so much to Diepenbrock, proved no mean feat. After the director and composer had tried in vain to engage the in those days famous dancer Lily Green, the young Hedy Lany was recruited to visually enhance the “Rei van aanzienlijke Mykeensche vrouwen” (Choral Song of the Eminent Mycenaean Ladies) for three voices. On 3 April 1921 the Concertgebouw Orchestra, conducted by Richard Heuckeroth, gave a concert performance of the Muziek bij Sophocles’ Electra. Although many people considered the absence of the text a loss, this performance fulfilled a fervent last wish of Diepenbrock, who died two days later. After 1926 it became common practice to perform sections of the Muziek bij Sophocles’ Electra (without part IV and VII) in concert. At first the declamation was executed by Jacqueline Royaards, who had taken part in the premiere, and from 1934 by the composer’s eldest daughter, Joanna Diepenbrock (1905-1966). Joanna, who was not an actress but a classicist and a singer, gave numerous performances of parts of the Electra both accompanied on the piano by her sister Thea Diepenbrock (1907-1995) and with various Dutch orchestras and conductors. In May 1935 August Defresne’s (1893-1961) prestigious mise en scène of Electra was premiered at the Dutch Music Festival with Diepenbrock’s music played by the Concertgebouw Orchestra, under Willem Mengelberg, who was celebrating his 40th anniversary as chief conductor of the orchestra that year. This production based on a highly expressionistic concept, with in the title role the in those days famous Charlotte Köhler (1892-1977), unexpectedly turned out to be a crowd puller, resulting in dozens of repeats. In consultation with the conductor Eduard Flipse (1896-1973), Eduard Reeser compiled the symphonic suite Elektra in 1952, which has been performed regularly. While Diepenbrock used this spelling of the names Sophocles and Electra, Boutens used the Dutch spelling Sofokles and Elektra. 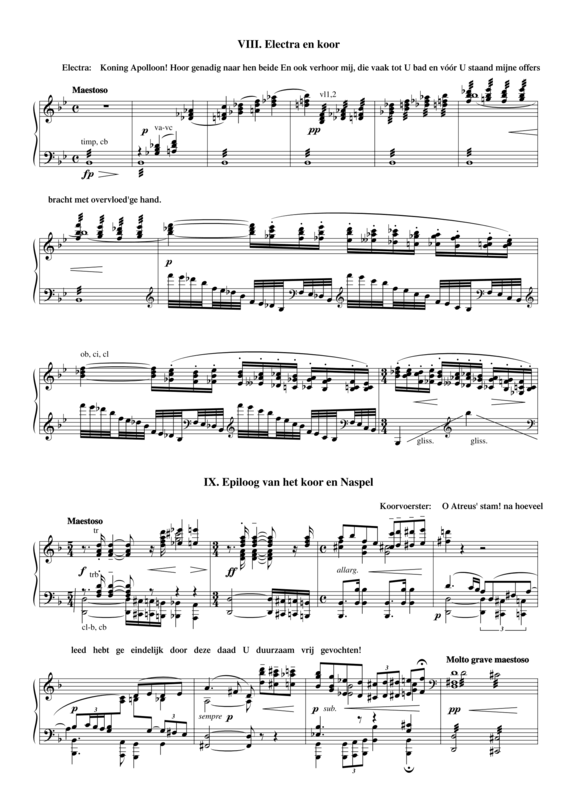 In the edition of the score (1932) and the piano score (1935) the Alphons Diepenbrock Fund used the now in the Netherlands accepted spelling with “f” and “k”. F.L. (Frank Luns) in ‘Haagsche Kroniek’, Het Tooneel 6 (1920), 110.